A few years ago, the social networking site Twitter was virtually unheard of. However, it then started becoming very popular with the rich and famous, prompting a massive surge in users from the general population. Or was it the other way round? What is it that makes this website so popular with the majority of those in the public eye? Well, there are several things that make this the case. Firstly, there is the ability to get their side of the story out there before the papers publish stories that famous people do not want to be believed. For example, many celebrities have taken to Twitter the night before a big story is due to be published to tell their fans that what they are going to be reading is not true. Whether they are telling the truth or not is not important, it is the fact that they are able to reach their entire fan base within a matter of seconds. This is one of the reasons why Twitter is a really useful tool for those in the public eye. Take a look at the celebrity boxer Amir Khan below doing just that! Another reason that many celebrities have commented on is that they are able to have more of a connection with their fans. Of course, there are many other ways to do this, but Twitter offers more of a personal approach. Many people use this site to talk directly to their fans on a one to one basis; something that just wasn’t possible with other sites that claim to offer the same thing. Not only is this popular with the famous users, but also their fans. Publicity is a very important part of being famous, and Twitter is one sure fire way to gain maximum exposure. The Twitter platform allows the famous users to get information to fans in an efficient manner. It is also a fantastic way of promoting events, new releases, or even interviews that are available online. Once a piece of information is published on Twitter it is then available for millions of people to see. Of course, this is a big part of the popularity of this website with the rich and famous. Twitter offers a very fast form of communication, and for those in the public eye, it seems to be a very easy way of communicating with their other famous friends. The downside to this is that the conversation is available for everyone to see, but to many celebrities, this is an advantage. As you can see, there are a lot of different things that make this social networking tool a massive hit with the rich and famous. Everyday more and more famous people are joining up and sharing information with the world, something that seems to be highly advantageous to them. Let’s take a look! We’ll use President Obama as an example. In the top right hand corner you can see a ‘follow’ button. All you have to do is make sure you are signed into your Twitter account. Once you are signed in, you click on the person that you want to follow, click on the button in the right hand corner and it is that simple, you are now able to follow all of your favourite celebrities. So, you know how to follow a celebrity, but how do you actually find them in the first place? Well, the easiest way of doing this is by using the built in search function on Twitter as shown below. Again, we’ll use President Obama as our example. As you can see, by simply entering ‘Obama’ into the search function at the top of the page you can bring up a page of result. 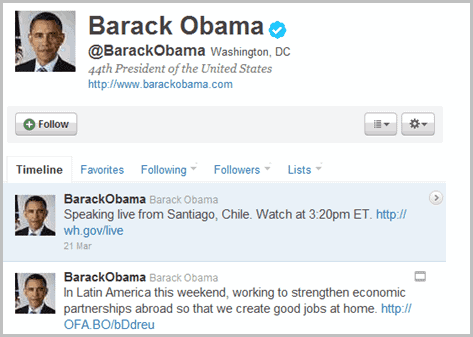 By clicking on the ‘People’ tab you will see that the Twitter page for President Obama is at the top of the page. You can then click on the page and follow the President. It really is as simple as that. If a celebrity has a Twitter page then there is no reason why you cannot follow them. If you are new to Twitter then you might be wondering about celebrities that you can follow. Some of the biggest famous names are active on Twitter and waiting for you to follow them. Let’s have a look at some of the most popular famous people that are currently Tweeting. Understandably, one of the most popular ‘celebrity’ Tweeters is President Barack Obama. As it stands the president has over seven million followers on his page. By following him you are able to receive updates about what is happening within the Whitehouse, as well as information about public appearances and speeches that are due to take place. Love her or hate her, Paris Hilton is one of the most popular celebrities on Twitter. If you want updates about the heiress, or want to know what is going on in the life of Miss Hilton, then you should definitely follow her. Websites like Celebrity Tweet, Celebrity Twitter or We Follow are good places to find celebrity Twitter users as well. The benefits of those sites are that you find a listing of many celebrity Twitter users on them, and that it is less likely that you fall pray to a fake celebrity which can happen if you use Twitter's search. Even the comments from Barak Obama are remaining tobe diarrhea. The level of comments from all these film- and tv “stars”, is even of a (ferry) much lower level. Main advice read something nice like this website, or here is an even stranger advice read a (literature) book. Paulus like you I do not follow celebrities, could not care less about their life. But a lot of people on the Internet love celebrity news, love to follow their “idols” and Twitter is one of the options they have. There is another compelling reason for celebrities to use Twitter. Celebrities can make money. And lots of money, very easily. tweets which are just ads on her Twitter account. past year on Twitter was 20 million dollars. have the most commercial value. Here is another version of Twitter, I present Sylvia Chenot http://twitter.com/#!/Sylviagyt Notice the time line besides the obvious spam content. This is a robot or script at work. Well best way to see if there is a match between ones interest and Twitter is to use Twitterfall for a while http://twitterfall.com/ Not a bad tool to check what is trendy or if some one has other interests than media junk. There are other sites like Witstream with my favorite JennyJohnsonHi5 as a strong contender http://www.witstream.com/#jenny_johnson There are real people with more than “Win Iphone here, retweet plz” on their mind. Have to look for them though. I finally buckled and joined twitter. However, I can’t seem to figure out how to “pipe” the tweets of the people I follow into an RSS feed, so I won’t have to go to twitter.com (I’m only reading, not posting tweets). Does anyone have a working solution for this? My last hope for finding a feed link was on “http://twitter.com/#!/MY-PROFILE-NAME/following”, but it just displays the loading animation ad infinitum. This occurs in both FF & Chrome (also with script-blockers etc. disabled). The other tabs (Timeline, Favorites, my own tweets etc. all finish loading quickly). You could use Digsby http://www.digsby.com/ or other tool supporting Twitter. The spam account I linked to is gone btw, Twitter does clean up! but talking about Twitter is also talking about spam, marketing idiots which is why closing ones circle is the sane thing to do. RSS, whatever tool to the rescue. Forgot to say I do use Digsby for 2 Twitter accounts with desktop notifications and all. Simple and does what I need. You can search their forum for how- to increase number of tweets available when you double-click account. You get new window listing x numbers of tweet from your account. Standard is quite low I believe, I use 100. Need to hack a bit for that, not in GUI. I know some developers who would rather tweet away than make a post on their website. Why I use Twitter basically.